From Romantic Castles and Palaces, As Seen and Described by Famous Writers, edited and translated by Esther Singleton; New York: Dodd, Mead & Company, 1901; pp. 354-359. 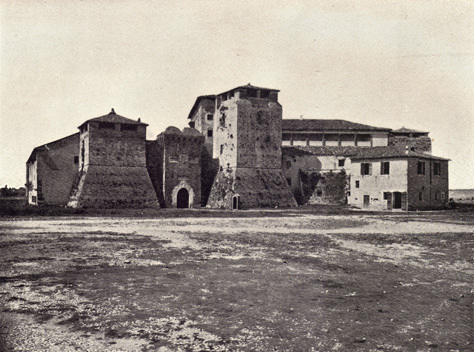 In 1294, Malatesta da Verucchio built the castle upon the same site, and he made of it at once a sumptuous residence and a solid fortress to which was given the name of Gattolo dei Malatesta. It is from there that Verucchio dates his will. The great Ghiberti, the sculptor of the “Gates of Paradise,” tells us, in his Commentaries that in 1400 he made some enamels for the apartments and that he painted some frescoes. Alas! nothing of these remains for us. In 1446, comes Sigismond, son of Pandolphe, the great warrior and conqueror, he who had been nicknamed 355 Poliorcète, skilful in making fortifications, pupil and soon the rival of Roberto Valturco, the celebrated author of the volume of Re Militari; he battered down the Gattolo, or, at least, he changed it from roof to basement at the moment when the discovery of artillery had changed all the conditions of the attack and defence of old castles. It was during this transformation that the frescoes and all the ornamentation, of which Ghiberti speaks, disappeared. Two superb inscriptions, one Gothic, the other of the first half of the Fifteenth Century, surmounted by the escutcheon of the Malatestas with the helmet crowned by elephants’ heads and the chess-board, are sure guarantees of these serious modifications. In order that they should be proved with more certainty, Matteo de’ Pasti, a pensioner of the lord of Rimini, struck, by order of his master, the superb commemorative medal representing the Rocca Malatestiana. Piero della Francesca, the great artist to whom we owe the greater number of the beautiful portraits of the Bentivoglios, the Montefeltros, and the Malatestas, brings us, in his turn, an unexceptionable proof, — the day when, in the temple of San Francesco of Rimini, the pantheon of the Malatesta family, he represents the lord of Rimini kneeling before Saint Sigismond, and gives the view of the Rocca as a background for this precious fresco. So imposing a mass should certainly have triumphed over time, but it has been disfigured at the pleasure of succeeding generations. Upon the ground where we walk while regarding the present façade, is dug the first enclosure, 356 a large moat a hundred feet wide and thirty-five feet deep, to-day filled up and forming a platform. We find no longer the six towers, eighty feet high, destroyed by Urbain VIII. (1625), who has also given his name to the building for more than a century, — Castello Urbano. Finally, in 1826, the first circuit was razed, and, the moat having already disappeared, they did away with the drawbridge. It is nothing more than a prison, through the gratings of which we see the red caps of the prisoners who come to gaze upon a bit of blue sky. Another tradition insists that the Malatestas, sons of Verucchio, lived, during the lifetime of their father, in a dwelling near the old gate of San Andrea; but the house designated, dating at most from the last centuries, belonged to the Graziani, and to-day it serves as the residence for the family of the Ugolini Micheli. One sees how difficult it is to establish anything even after long inquiry; however, the conclusion of the historian, Tonini, must also be our own: the cruel scene must have taken place in Rimini, and probably in the Gattolo de Santa Colomba, that is to say in the fortress known to-day under the name of Rocca Malatestiana, a residence greatly disfigured and modified, where it would be impossible to identify the exact spot of the murder, but which, according to a number of chronicles, was at the moment this murder was accomplished, a princely residence, “containing noble apartments,” with the exterior appearance of a castle. Since Francesca was born in Ravenna, why has posterity unanimously designated her under the name of Francesca 357 da Rimini? Logically she should be Francesca da Ravenna; but she lived in Rimini as the wife of Giovanni Malatesta, and it was there that she expiated her crime, or her weakness, by death; it was there that her tomb was made, and posterity will therefore forever call her by the name of Francesca da Rimini. Moreover, if we sum up the opinions of the chroniclers and historians, it is understood by the most of them that the deed was accomplished in this town, and they doubt it so little that the idea never occurs to them to support a contrary opinion. Marco Bataglia, Benvenuto da Imola, Fra Giovanni da Serravalle, and Baldo di Branchi furnish proofs that might be considered as negative; but if they do not cite the name of Rimini, it never occurs to them to mention any other town. As for Jacopo Della Lana, Gradinego and Boccaccio, all three name the city of the Malatestas, and later, when Silvio Pellico and many other dramatic poets of other nations will write their dramas, their poems, or their stories, they will not hesitate to place the scene in the same city. Count Odoardo Fabri will not do otherwise, and if Lord Byron had realized the plan he conceived and which he made known to Murray, his publisher, in the letters which are now in everybody’s hands, Rimini would still be the scene. Is it necessary to speak of our compatriot, M. Auguste Thomas, the composer of Mignon, who having written the score of Francesca da Rimini, dedicated it to M. Tonini, the librarian of the Gambalunghiana. She belongs to the history of this town, or if you prefer, to its legend. It is in vain to turn over the leaves of the archives, you cannot deprive the city of the Malatestas of its touching picture. Upon what document Sascorbaro relies for this statement no one can say; there was no inscription, no medal and no sign whatever that could certify to the identity of the skeletons; but the legend was evidently established, since Boccaccio and the greater number of the chroniclers had said that the two bodies were united in the same tomb. The assertion of Sascorbaro, deprived of all proofs as it is, has come to confirm the opinion of the Florentine story-teller. 359 Rimini persists in its legend, if legend it is; and I also discovered a few days ago, at Gambalunghiana, the bit of silk tissued with gold, and placed in a frame upon which the erudite son of Tonini, successor to the historian of Rimini, does not willingly call to the attention of learned historians, because history desires authentic proofs; but the common people view with great pleasure a contemporary relic of Francesca and Paolo. * To read an early Italian short story with a Malatesta as the hero, see Novella IX, by Sabadino degli Arienti, translated by Thomas Roscoe, on this site. * For a history of the Malatesta family and their castles read Chapter XI, The Strongholds of the Malatestas, in Famous Castles & Palaces of Italy, by Edmund B. d’Auvergne, on this site.